Use black paint in feng shui for an auspicious color. You can use black to enhance various areas of your home where you need a water element. The north sector or north area of a room is the ideal area to use black to represent the water element. Each compass direction is assigned an element and a color (often more than one color). The north sector element is water and black is the prominent color assigned to the north sector though blue is also used to represent the water element. The north sector governs your career, so the color can be played up to boost this area of your life. The north sector of your home is an excellent starting point for feng shui decorating and the use of black paint. If the north sector of your home is used for an office or den, then you can take advantage of the color black in your décor. There are several ways to incorporate the feng shui color black into your home décor. Be sure the water element is an appropriate element for the sector you choose for a black paint project. For example, the south sector element is fire. Adding black to this area will tamp down the fire element. Unless you are dealing with a specific issue where either the destructive or exhaustive cycle is needed, then the color black is not an auspicious color for this area. One of the easiest ways to add black to a north sector room is to paint the floor. 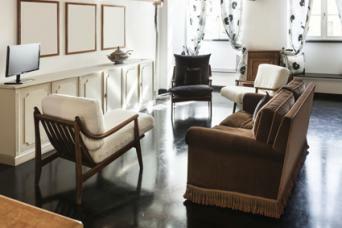 For a dramatic effect, paint hardwood floors a rich black with a high gloss finish. A high gloss finish is very elegant, but a matte finish can give your room a more contemporary look. If you find a black floor too intense, consider using stencils on the floor. Paint a stencil border in black along the outer edge of the room, leaving the current floor finish intact. Go for a dramatic effect by stenciling the pattern over the entire floor. Another approach is to stencil an outer border and add a center design. You can also add several hues of blue, ranging from navy blue to pale blue for a more intricate water element design. Instead of painting the floor, you may decide to focus on the walls. Stencil the walls instead of the floor. You can paint the north wall in almost any sector, although you should avoid water elements in a bedroom or kitchen. There are several damask and lace style stencils that can be used to create a rich addition to a room or the north wall of a den, office, or north-facing foyer. You can also use silhouette stencils, such as a cherry blossom for an elegant touch. If word art is your thing, then choose an appropriate stencil and paint it black. Black will go with just about any color. For example, a room with painted blue walls is an ideal candidate for black damask stenciling. With this technique, you aren't limited to just the north sector. For a flair of the dramatic, paint the entire north wall of your office black instead of using stencils. You can then add various wall art to break up the space. Another great way to use black paint is to highlight architectural features in a room. 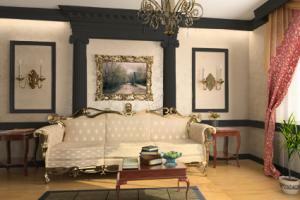 This can be something as simple as painting the doors, crown molding, or a window casing black. Corbel shelves or wall pedestals painted black can serve a display for career awards or a favorite collection of art objects. Built-in shelving units or bookcases benefit from black stencil designs painted on the back wall. While columns create poison arrows, painting them black can have a stunning effect for a room design. You can still neutralize the poison arrow effect with a multi-faceted crystal suspended in front of the column or with a leafy floor plant. You can paint some furniture pieces black for excellent feng shui additions to your home, except for rooms located in the south sector (fire element). For example, a great upcycling project for a dining room is to paint wooden chairs black. You can use a stark contrast with lighter wood finishes on other pieces of furniture in the room, such as a light wood finish for the table. From a design perspective, you'll want to add other touches of black throughout the room. These can include painting a light fixture, candlesticks, picture frames, and a mirror frame black. You can also paint other pieces of furniture in your home. Place these along the north wall of the room for the best effect. Avoid painting bedroom and kitchen furniture black. If painting the wall or floor black doesn't appeal to your design sense, then consider adding a couple of design elements to your office. These can be painted black and effectively blended into your overall office interior design. The most obvious object to paint black in an office is the desk. Like the floor project, you can either paint the entire desk or paint black stencils on it. Create a corner vignette with a folding screen. The easiest way to use this design element is to paint the wooden frame black and leave the rest of the screen in its original form. If the screen consists of wood panels hinged together, you can paint the screen black and set a black and blue upholstered lounge in front of it for a quiet reading area. A pedestal can be painted black and used to support a small water fountain on a north wall or north sector office. Be sure the water flows into the room and not out. If you're an artist, use black paint for the pedestals displaying your work to further boost your career. If your office is in the south sector of your home, you can still activate the north wall with black. Purchase a sheet of lattice from your local hardware store. The diamond shape formed by the lattice is one of the feng shui symbols for fire and will reinforce the fire element while preventing the water element (black paint) from extinguishing it. Cut the lattice into various square and rectangle shapes and frame with molding. You can place these on the north wall for a unique look. The easiest way to introduce black into a décor is to paint various objects. Choose from existing objects you no longer use or go shopping at a garage sale. 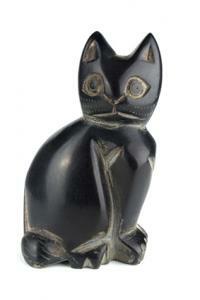 Consignment shops often have great finds that you can transform into a striking black accent piece for your home. You can use black paint as a feng shui design element to boost the water element in the appropriate sectors of your home. As with all things feng shui, balance is the key to a successful feng shui home.